I’ve now been homeschooling for 8 years. My homeschool today does not quite look like I pictured it years ago when we first began. We take unplanned days off when I need a sanity day. I love a good schedule or a routine. I like things planned and I want everything to happen right on time. And I absolutely hate to feel “behind” when it comes to my homeschool. True, you can’t really be “behind” in a sense because you are setting your own schedule and you are the on making the plans. However, all homeschool moms know that nagging feeling of falling behind on your expectations of the school year. Well, sometimes I throw all those worries and guilt out the window and we take a day to sit around the house and do nothing. We watch a movie. We build Legos. We go outside for the entire day. Basically, no formal school work gets done on those days. Sometimes, I even send my kids downstairs or to the backyard while I curl up on the couch with a good book. These are my “sanity days.” On these days we take a break from the regular routine and follow our own pursuits and do the things we most enjoy. By the next day I’m motivated to continue to move forward with our regular homeschool days. But occasionally we just need a sanity day to help reset our attitudes. I now use textbooks and workbooks. When I first started homeschooling I was convinced I was a classical/Charlotte Mason homeschooler. I would take nature walks and read nothing but twaddle free living books. There would be no workbooks or textbooks inside my house. Well, we all love textbooks and workbooks. My kids enjoy completing the workbook pages and bringing them to me so I can check them and draw stars on the top. We love giant, colorful textbooks as our spine for science or history. Guess what? My kids are learning. They are enjoying our homeschool. They find our days more streamlined and efficient, which leaves them more playtime in the afternoon. So, while our house is filled with wonderful and beautiful books, both fiction and non-fiction, we use textbooks and workbooks daily in our homeschool. And I’m slowly making peace with the fact that my homeschool looks a little different than I originally envisioned. We use online classes and video school. In the beginning, I chose parent-intensive curriculum and I taught every subject to every child individually. You can imagine how well that goes when you have a large family. That led straight to homeschool mama burnout. I was exhausted! I’ve learned to simplify and take a few things off my plate. Enter online classes and DVD’s. My older kids all have a few classes that are taught online or through a DVD. They do their work and then bring it to me for grading. This is amazingly time-saving for me. I am loving the variety of a few parent-intensive subjects with a few independent subjects thanks to online learning. I have some of my time back and my kids are thriving with the eclectic mix of resources that we utilize in our homeschool. I don’t participate in a co-op or support group. 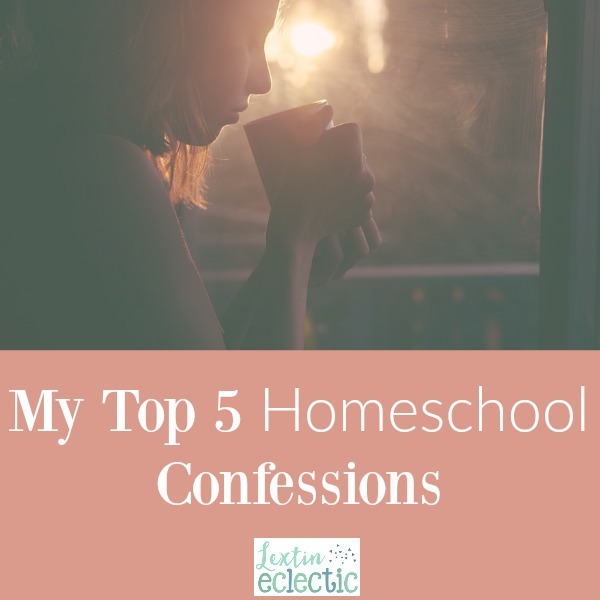 I have tried homeschool co-ops multiple times. They simply do not work for me. I hate dragging my kids out the door and loading our van with bags, books, and supplies and driving to a co-op once a week. Then we all come home tired and crabby to begin our evening routine with extracurricular activities. I also loathe volunteering for a co-op and teaching classes. The prep time makes me want to cry and I don’t feel at all creative and inspired. I feel that I can only just manage to teach my own children. I don’t want any additional responsibility added on me. I’m also not very present at local support group meetings. I should be an amazing homeschool mom and involved in lots of local events. But the truth is, I am just barely keeping up with my kids’ activities and events with our church. I don’t have any blank space on my calendar. I occasionally grab dinner with a homeschool mom friend, but I’ve learned to accept that we are all very busy and in our short amounts of down time, we usually want to stay home and spend that time with our families or even all alone. Actually, if I’m being very honest, being alone is my most favorite thing. I will always choose a few hours of silence to any group activity. I don’t always enjoy homeschooling. Yes, I’m glad I homeschool. Yes, this is something we choose to do for our family. No, I have no plans to stop any time soon. However, as wonderful as homeschooling is, it is exhausting and stressful and draining. Some days I simply don’t enjoy my role as a home educator. On those days, I’d rather just have the responsibility of mom and not the added responsibility of an educator as well. There are times that my kids are all fighting and complaining and I wonder why I continue with this crazy life. In the end, I know why I homeschool. I understand our family’s vision and mission. But that doesn’t mean that every day is sunshine and rainbows. At times, I want to quit and find the nearest bus stop. Yet, I’m still here. Homeschooling on and mostly enjoying the journey. It’s a blessing and I wouldn’t ever want to miss these years.